After revolutionizing wireless audio experience with AirPods, the Cupertino-based tech giant has officially unveiled the new generation AirPods with the new H1 chips. 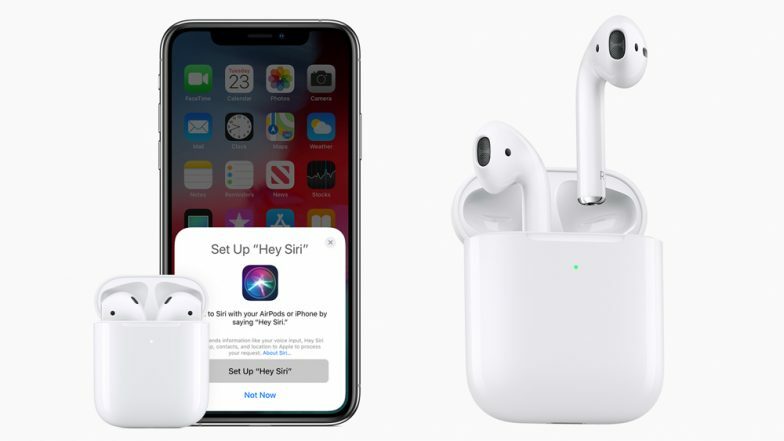 Dubbed as world’s most popular wireless headphones, Apple claims that the new AirPods gets better performance, hands-free Siri, longer talk time and a wireless charging case. The interested customers can order the new AirPods starting from $159 that goes up to $199, which gets Qi-based wireless charging case. Google Stadia is New Cloud Gaming Service From Google Unveiled At 2019 Game Developers Conference. The deliveries for the new generation AirPods are expected to start sometimes next week probably March 26 onwards. Moreover, the new wireless charging case comes with an LED light indicator that shows the charging status, so that you can keep a check on the proper wireless connection. Previously, the LED was incorporated inside the case on the predecessor, however, the additional effort of opening the lid has been removed by Apple. The upgraded AirPods are offered in two versions, the headphones with wireless charging case costs $199 whereas the device with standard case retails at $159 price. Interestingly, the existing owners can upgrade to the new case in just $79. As a reminder, the next generation AirPods were unveiled after the release of hardware-heavy week from the iPhone maker. Earlier this week, the company introduced new generation iPad Mini and 10.5-inch iPad Air followed by new range of iMac devices. On the contrary, the company also slashed the prices for SSD upgrades for the MacBook Pro, MacBook Air, and Mac mini.